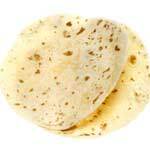 Tortilla: A thin disk of unleavened bread made from masa or wheat flour and baked on a hot surface. The Glycemic Index, GI, is a scale that ranks carbohydrate-rich foods in order of how they affect body's blood sugar levels( glucose) compared to glucose or white bread. The GI of glucose is 100. Not all the carbs have the same effect on body. After we eat, foods that contain carbohydrates, our blood glucose level rises with a speed called " Glycemic Response". Glycemic response is influenced by the amount of the food we eat, type of the food, and how the food is processed or prepared. When we eat a boiled potato, glucose levels spike in milliseconds. With legumes or fruits and vegetables, they go up in about 30 minutes. In general, the lower the glycemic response the better the quality of food. Foods that have lower Glycemic Response,Glycemic Index, cause only small fluctuations in blood sugar levels or insulin levels reducing the risk of coronary heart disease and diabetes in the long term and helping the body to maintain a healthy weight. Carbs, based on their GI rank, are categorized to three groups, Low, Medium and High GI Foods. lower rise in blood glucose levels. Examples are Porridge, Apple and Sweet Potato. blood glucose levels to go up at a moderate rate. Examples are Pineapple, New Potato and Mango. blood glucose levels. Examples are Jasmine rice, Cornflake and Watermelon. How is the GI measured? Firstly, a small group of volunteers are each given a serve of food that contains 50 grams of carbohydrate. Their blood glucose levels are measured every 15 minutes, for the next 2 - 3 hours. The results are then plotted on a graph and a computer program measures the size of the graph. The average response of the group to each food is then compared to the response to the standard (glucose) to create the GI. What factors affect GI rating?